Barbie: The Special Sleepover is the story of the weekend that Barbie hosted a sleepover party for her little sister Stacie and her three best friends Kristen, Alison and Emily and as it turns out it's their first ever sleepover. This book covers a range of activities that kids can do if they choose to hold their own slumber party, including singing, treasure hunting and singing. It also reassures the reader that it's ok to be a little nervous about staying overnight in different surroundings. Barbie The Special Sleepover is a hard cover book, with a wonderful photo of Barbie and her little sister, all ready for bed and brushing each other's hair which is just adorable and was photographed by an anonymous photographer. Francine Hughes beautifully wrote this book, for early readers who are fans of Barbie and who may be interested in sleepovers and was delightfully illustrated by the team at S.I. Artists. 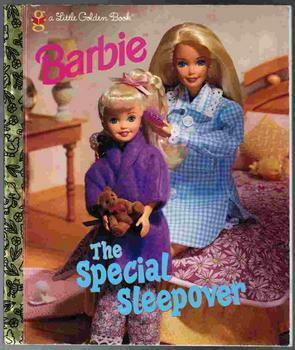 A Little Golden Book: Barbie The Special Sleepover was published by A Golden Book New York in conjunction with Mattel in 1997. Why? Because it's a must for Barbie fans!